Accessorize your favorite outfit or spice up apparel that just needs some extra kick Glorious/Fabulous with Siam Red Crystals Spider Brooch body with clear 8 Legs & mounted Crystals on her legs her long graceful legs sparkle This piece is just SO stunning! 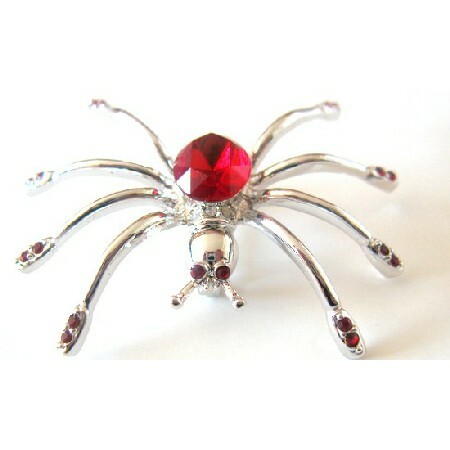 Siam Red Crystals silver plated 8 legs with brilliant Very Sparkly! An absolutely gorgeous vintage brooch. Give every ensemble a feminine touch with this beautiful brooch. Add a dash of drama with a bold eye-catching brooch. The brooch is beautiful crafted & authenticated attaches securely with pin clasp. Picture this lovely brooch on your favorite dress shirt scarf or jacket lapel. Pin Length : 1 inch longwide 2 inches.